These Carbon Steel Comals are very durable and properly taken care of will last for years, and are most lighter in weight over cast iron ones. The Carbon Steel Comal, like cast iron skillets or woks, becomes seasoned and lend the foods cooked on them little extra hint of flavor, unlike modern nonstick ones that lend nothing to the food. The dry roasting of ingredients on a hot Comal builds layers of flavors with the charred skins of the vegetables adding extra flavors. As with most products which are handmade by artisans around the world, the metal comals may have slight imperfections in the form or finish of the materials. Since they are made of Carbon Steel, you may find some slight rust spots, however this is normal and will be eliminated during the curing process. If properly cared for, it will not rust again. A Carbon Steel Comal is perfect for roasting vegetables & chilies, and perfect for making quesadillas. The video to the right shows a women in Mexico making a quesadilla on a HUGE Carbon Steel Comal.It is also the utensil of choice for cooking or heating tortillas. The Carbon Steel Comal can use it on the stove top, both gas and electric, as well as the oven, grill or open flame. Simply put the Carbon Steel Comal over the heat source and bring it up to temperature. Be careful when handling the Carbon Steel Comal as it gets very hot, even the handles. It is best to let cool before attempting to move it. If you do need to move it, use thick kitchen mitts or several layers or kitchen tools to prevent it from burning. Comals are easy to take care of, however if not cared for properly, IT WILL RUST. Therefore, make sure that your Comal is properly cleaned and stored after each use. To clean, simply wipe down the surface of the Comal with a paper towel or kitchen towel or dry sponge, using a sponge or nonmetallic scrubbing pad if necessary to scrape off any excess food. If it is especially soiled, you can rinse the Comal with hot water, gently scrubbing away any food particles with a sponge or nonmetallic scrubbing pad if necessary. 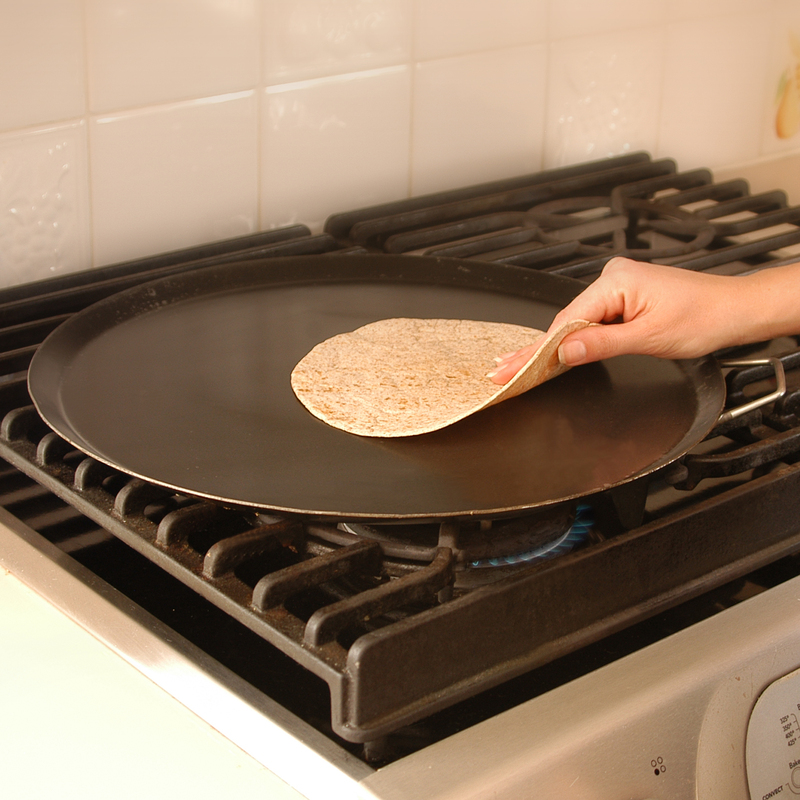 The Comal should not be left to air dry, but rather it should be heated to ensure that all moisture has evaporated. After heating the Comal, remove it from the heat and add a thin film of oil over the entire surface using a paper towel. Use oven mitts if the Comal is still too hot to handle. Wipe off any residual oil and store until you use again. If rust does appear, simply wash the surface of the Comal with hot water, and remove any traces of rust using steel wool if necessary, and re-season it as above. Never clean or scrub a seasoned Comal with soap or harsh chemicals or put it in a dishwasher, unless it is absolutely necessary to meet health regulations. These chemicals will damage the seasoned finish of the Comal. Rinse and dry thoroughly. Much like a cast iron skillet, a Carbon Steel Comal needs to be seasoned before use. The first step is to remove the manufacturer’s protective oil coating. To do so, wash the Comal thoroughly with hot water and a small amount of liquid detergent, using a scrubbing pad if necessary. Rinse and dry the Comal thoroughly. Before starting the process, choose an oil with a high smoke point such as peanut, canola, or grape-seed oil. The seasoning process will require the oil to burn at a high temperature which creates smoke, so make sure there is adequate ventilation by opening a window and/or turning on your kitchen hood. Use a pastry or BBQ brush and cover both sides of the Comal with a generous coating of the oil, and place the Comal on high heat for about 30 minutes. As the oil begins to burn and darken the Comal, reposition the Comal periodically to make sure to cure the entire Comal. Let the Comal cool and remove any excess oil with a paper towel. This process is better performed on a grill.Your Comal is now ready to use.